This amazing working model of the human heart and circulatory system will bring your lecture to life! 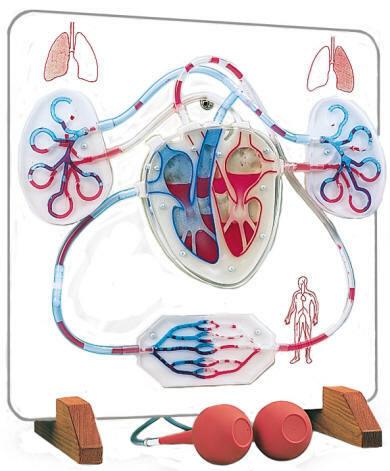 A complete schematic model of the human circulatory system with "blood" (colored water) that flows through transparent veins, arteries, capillaries and heart chambers. This model's special design portrays venous blood, a deep reddish purple and arterial blood, a bright red to give visual reinforcement to the oxygenation and deoxygenation of hemoglobin as it travels the body's vascular network. The functional heart and circulatory system are mounted on a baseboard with support legs and supplied with teacher's guide, red dye and syringe for refilling the system.